With the 2019 general election less than one year away, the preparation for the election appears on top gear. The political parties have begun the process of selection of their candidates. The IPOB leader, Nnamdi Kanu, before his disappearance, had promised there will be no elections in 2019 in the old eastern region of Nigeria [Biafraland] unless a referendum is conducted. The spokesman, Emma Powerful of IPOB spoke to 247ureports.com concerning the threat of no election in 2019 along with other matters sorrounding Nnamdi Kanu’s disapperance. The Nigerian federal govt recently gave an award typically reserved for only ex president to Late MKO Abiola – and then declared June 12 as democracy day. How do you view this? Would you demand he makes May 30th, Biafra Day? Yorubas are learned, cosmopolitan and urbane. Surely they have enough intelligent people in their ranks to understand the damaging effect these periodic politically motivated inducements from the North can be in the long run. Unless Yorubas are driven by political expediency which we doubt, then this gesture from ‘Buhari’ s too little, too late. This present confusion, which is the only way to describe the apparently unsolicited magnanimity from Buhari’s handlers, was exactly what obtained when in exchange for the empty title of APC National Leader and few ministerial appointments, Yorubas returned into power what will go down as the worst regime in living memory. That mere posthumous elevation of Abiola to a GCFR is sufficient to erase the horrors this Buhari regime inflicted on the masses is laughable because well meaning Yoruba people will not buy into it. If they do, it will speaks volumes about their political priorities in Nigeria. They will be seen as pursuing a purely parochial agenda of self preservation at the expense of the collective well being of all ethnicities in Nigeria. It will be contrary to everything their Ibadan Declaration in 2017 stood for. IPOB had earlier promised that 2019 general elections would not hold in Biafra land. Is IPOB still standing on the promise? The simple answer is yes! The boycott of Anambra governorship elections in November 2017 was a test run. We now have a better understanding of how they react to election boycott threats, what tools they deploy including falsification of voter figures, and how they deploy it through INEC to fool the masses. We are equally more aware of their media strategies and how they managed to dish out misleading and false information about voter turn out figures to the media. Having learnt a great deal of their strategies, our approach has been refined to make sure we mitigate such moves next year. That is why we are ecstatic that presidential election will come first. On that day the world will witness a new level of compliance from Biafrans because the election will be turned into a referendum, it will not hold. We shall continue to boycott elections in Biafraland regardless of the consequences until we get a date for our referendum which will ultimately ascertain what we Biafrans want. Power belongs to the people not a few educationally challenged Fulani men remote controlled by neo-colonialist interests hell-bent on perpetuation the unworkable status quo in Nigeria. Our people (Biafrans) must decide what they want, not these Arewa slaves we have in Ohanaeze Ndigbo and government houses in the East parading themselves as leaders when clearly they are not. Since the disappearance of Nnamdi Kanu, the activities of the IPOB seem to have suffered setback. Why has the IPOB not selected a replacement for Nnamdi Kanu? I don’t know where you got this widely touted but misleading and erroneous impression from that IPOB suffered a setback as a result of the arrest and possible assassination of our leader. Are you not aware of our activities in Lagos, Enugu and Awka where IPOB effectively brought the reign of Hausa Fulani appointed Arewa slaves in Ohaneze Ndigbo to an end? The humiliation Ohaneze Ndigbo suffered at those events means that politics as usual in the East has come to a permanent end. Selling the interest of the masses in return for political appointments and contracts for family members of Ohanaeze Ndigbo leadership has ended. Our resoundingly successful sit at home order is another reminder that even in the absence of our leader, IPOB remains as indomitable as ever. Mazi Nnamdi Kanu tutored us for years on Radio Biafra on the need to be resilient regardless of the enormity of the odds against us. It’s a lesson that have stood us in good stead in his absence. IPOB was designed and engineered from inception to be an indestructible fighting machine. Efforts will be made to pull her down, criminals with the help of DSS and Ohanaeze will float alternative ideas including Biafra Coalition all in a bid to weaken IPOB but will fail. We learnt from the mistakes of the past, so we structured the Movement in such a way that we are driven by the supremacy of our ideology anchored on the doctrine of the leadership of Mazi Nnamdi Kanu not mere presence of anybody. Mazi Nnamdi Kanu our leader is irreplaceable. Let us be honest with ourselves, who can do what he has done? Name one person you think has his personality, education, charisma, oratory, gift of prophecy, integrity, bravery, organizational prowess and sense of sacrifice. Who in Igboland or entire East will sacrifice his wife, children, father mother and wider family for the sake of liberating his people the way he has done? People talk, issue press statements, hold colloquiums and disappear. Mazi Nnamdi Kanu rejected billions of dollars, shunned oil wells, said no political appointments and insisted on freedom for his people even as Nigerian soldiers were coming to kill him and his parents. Who else can do that? Can you as a journalist think of anybody who can do that? Give me the name of one person who can do what Nnamdi Kanu has done in this day and age anywhere in Nigeria without government backing. You see, there is none like him. Chaffs will come and go but Nnamdi Kanu’s legacy shall remain for eternity. Why do you think Ohaneze Ndigbo, Igbo governors especially Dave Umahi, Willie Obiano and Okezie Ikpeazu want Nnamdi Kanu dead, even more than the Fulani cabal in Aso Rock he is fighting? His Afaraukwu community where his father is the traditional ruler is under siege surrounded by Fulani soldiers at the invitation of Okezie Ikpeazu and Ohaneze Ndigbo because he refused to compromise his position on Biafra. Now Ohaneze Ndigbo and Igbo governors have failed, did they not rally a group of hardened saboteurs and pro-money agitators in the name of Biafra Coalition to destroy the unity, sense of purpose and direction Kanu brought to the struggle for Biafra emancipation? But they have failed already. Biafrans know they have only one leader and that is Nnamdi Kanu. Nobody replaced Nelson Mandela in all his years in captivity so nobody will replace Mazi Nnamdi Kanu. IPOB deputy leader Uche Mefor and IPOB Directorate of State headed by Mazi Chika Edoziem is doing marvelously well. They will continue to enjoy the support of IPOB worldwide and friends of Biafra until Biafra is restored. Is Radio Biafra still operational? How about the Hausa service? Radio Biafra is ever operational on FM, AM, Satellite and TV. All efforts to jam our signal, buy up our contracts with service providers, detain innocent Biafrans on the pretext that they provided technical assistance to Radio Biafra has never stopped our work or slowed us down. Radio Biafra will announce the rebirth of Biafra and until that happens, it will continue to be operational. The Hausa Service of Radio Nigeria on shortwave sponsored by IPOB is also fully operational and winning many converts on a daily basis. We continue to record high levels of listenership. For the first time in decades ordinary northerners are being educated on the reality of the totalitarian tendencies of this Buhari regime. Protests against Buhari’s government is springing up all over the north thanks to our Hausa Service enlightenment programs. There are changes happening all over the north and we hope over time that these will manifest in the overthrow of existing Fulani feudal lords especially in Hausa towns and villages. Many of IPOB remain incarcerated in many detention centers across the country. What efforts are leaders of IPOB making to get their freedom? Our legal team is the very best money can buy. No expense is spared in securing the finest legal services for our people who I must add are detained illegally. We have managed to secure the release of many of them and will not relent until all are set free. We have initiated law suits in international courts in three continents and hope to bring many more in the coming days. Nigeria will never have rest or peace of mind as long as there is an IPOB family member in their custody. Every victim of illegal detention has a lawyer and a dedicated IPOB legal team at their disposal. Families of detainees are provided for, where the person incarcerated in the bread winner of the family. We don’t abandon our own. The banning of IPOB by the federal govt seems to have been effective in truncating the activities of IPOB, are there any moves to unban the IPOB? There is an impression we must correct with this issue of banning, proscription and terrorism tag. It was Nnia Nwodo’s Ohanaeze Ndigbo and South East governors that came up with the initial idea to kill and tag IPOB a terrorist organisation before their Fulani masters adopted and perfected it. These so called Igbo leaders are the people that should held primarily responsible for the banning of IPOB, killings and subsequent betrayal of Nnamdi Kanu. Contrary to popular expectations amongst Igbo leaders and their Fulani masters, what the banning of IPOB did was to bring much needed international awareness to our movement because natural human curiosity led many people and governments all over the world to enquire about this new terrorist group in Nigeria. Upon closer inspection, they discovered that it was the government itself and their beloved Fulani herdsmen that are the actual terrorists. As you know we are in court challenging the obnoxious, illegal, dictatorial and undemocratic proscription of IPOB. It is the government that is running from their own courts. We are prepared to go all the way to the Supreme Court and beyond until the politically motivated tag of a terror group is removed. Are any groups from the South south and South east helping in reversing the ban? There is nothing like South South and South East when it comes to our agitation for Biafra. We have only one East, one IPOB, one Biafra. South South is an anomaly because there is no geographical cardinal point known as South South, the same way there is nothing like North North or West West. Anybody referring to coastal Biafrans as South South is only perpetuating widespread ignorance. IPOB is a mass movement of the people of Biafra. Help is coming from everywhere around Biafraland and beyond. IPOB national coordinator in Biafraland is an Ijaw man, his deputy is Ibibio. They run the day to day affairs of IPOB, that is why anybody referring to IPOB as an Igbo group is either deluded or being deliberately mischievous. Some say Nnamdi Kanu is hiding somewhere in the Niger Delta. Some say he is outside the country. Some say he is with the military. Where is he? Only Ohaneze Ndigbo, South East governors and Nigerian Army can tell us where they are keeping our leader or what they have done with his body. Those that conspired to bring Operation Python Dance should be in a better position to answer these questions. The bullet holes in his home, the dead bodies of 28 people massacred in cold blood on the orders of Igbo leaders and executed by Buratai’s men is a pointer to where any question pertaining to the whereabouts of our leader should be directed. What we are still trying to ascertain is if Britain was informed before the deadly invasion was carried out because they are the godfather of the Arewa North and Nnamdi Kanu a British citizen. Idle speculation about possible sightings of our leader in weird and sometimes wonderful places is a mere distraction. Nigerian Army, Ohaneze Ndigbo and South East governors must account for him at the right time. 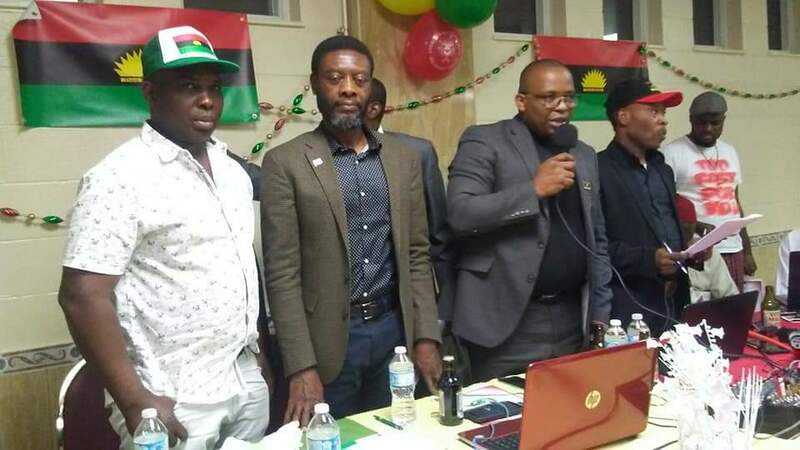 What is next for IPOB? Referendum and total collapse of Nigeria. We are not going to stop until Nigeria ceases to exist. If oil and gas revenue is their problem then arrangements can be reached to share the proceeds with the North and West under a binding and internationally supervised treaty. What we want is our freedom nothing more. Oil and gas is for lazy, ignorant people like Arewa Consultative Forum to depend on. We Biafrans are neither lazy nor ignorant so we view oil and gas deposits in our land as a distraction and a curse because without it the British would not have insisted on one Nigeria after independence. If oil and gas wells were to run dry today, that will be the best gift from Almighty God because only then can neo-colonial oil and gas industrial complex leave us alone to become a free people. Referendum is the only way out for Nigeria for peace to come to zero country called Nigeria. All hail Biafra.